The photo above is of a Vietnam veteran, George Ritter. and individualistic. 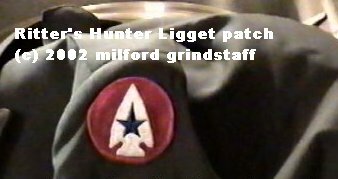 He says he was stationed at Hunter Ligget also. 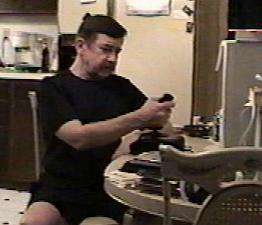 He reported a close encounter in the late 1960's there and was set up for not retracting his story. He has a hobby of watching for ET and video taping them. Below is one such image he sent to us. 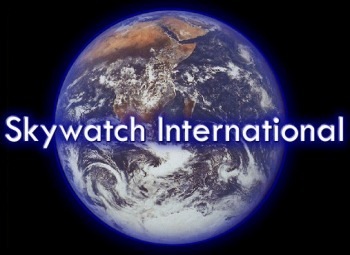 Skywatch's Bill Hamilton (former military officer) says "This is not proof." Others say it is merely an insect or smudge on the lens. A Hollywood photo lab- movie and video expert claimed they would prove it was a hoax- that was months ago and we never heard anything more from them. 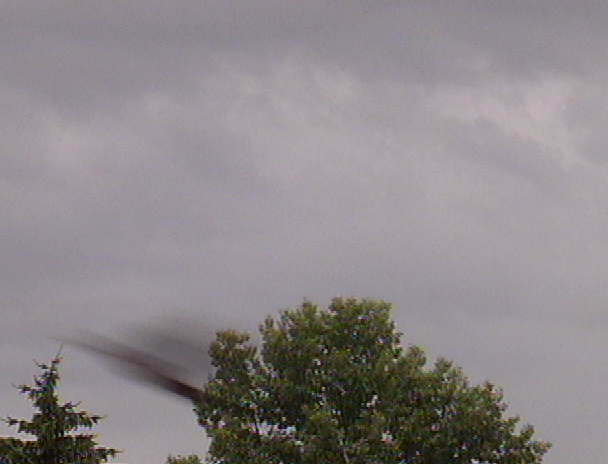 This image appeared on ONE frame of George's new cam corder...his yard has been the location of many, many ufo photos he has taken over the past several months. Well-what do you think? If this is a fake, they managed to completely capture the exact craft that many have described in some detail. Milford Grindstaff, an online aquantaince of George Ritter's (they both claim to have been stationed at Hunter-ligget where they had alien experiences) said that Ritter had asked him if the Aliens might show themselves for his newest cam...Milford has had several very close proximity UFO-Alien experiences, some with several witness's observing. Ritter says he has nocturnal visitors and was regressed by Bud Hopkins several years sgo. Grindstaff asked if his Alien contacts if they would do this and a few days later the image was observed on the single frame as Ritter scanned the tape in his usual manner. He has been taping and watching for these images for some time. This is the best image to date. Previous attempts to fool the public with fake pictures almost always involve dozens of pictures of clearly defined craft, Ritter has only this single frame that is so detailed. He has shown no motivation to gain from this and offered to share it freely with researchers, provided they guarantee they will return the original. The large conspiracy website operator Ritter entrusted with an original tape ,never returned one of George's originals and also privately stated they (visible object) were fake or simply insects.. This same website operator had to change the title of his website as the name was tradmarked! (casting doubts on his honesty?) Other stories also turned out to be poorly researched as well. He also told Grindstaff that he doubted he would do a further interview with him as he felt "his material was to conspiratorial" an amazing statement as his main banner ad has promoted a 200 page bio weapon survival guide book that was selling for over a $100 each. His main UFO reports there usually involve a host of bizarre aniumal mutilations and seldom addresses the issue of friendly Aliens. Current storys featured have describe New World Order plots to corrupt the USA or "spy" scams to fake terrorist attacks interspersed with money hungry financial conspiracys. Prominent extremist websights also seem to be major contributors there.